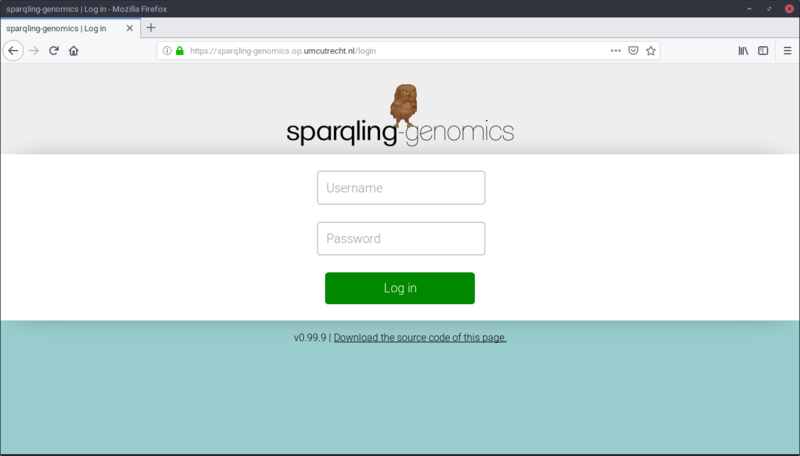 Today I would like to share the work I've been doing on SPARQLing-genomics -- an attempt to open the door to logic programming using RDF and SPARQL to data scientists. Its primary users are (data) scientists working primarily with DNA and RNA data. Unfortunately, most users are familiar with programming in R and/or Python, and fortunately GNU/Linux command-line tools. A typical bioinformatics project in our group starts with sequencing data, in the form of FASTQ files. DNA data is then mapped to a reference genome and variants are called using a “standard” software pipeline, resulting in Variant Call Format (VCF) files. At that point, analysis becomes non-standard, as the experiments differ in purpose and setup. This is the point where I think the RDF's simplicity can be of significant benefit to the data scientist, and those who attempt to understand the computational ground on which claims are made. The first thing to establish is information-parity between the “standard” pipeline output and its RDF equivalent. Naturally, developing tools to do that was my first priority. This program lets the VCF file specify its own ontology, deferring the complexity of loose definitions to a time where we have SPARQL to connect the comparable attributes of variant calls. Both vcfrdf and table2rdf use the SHA256 hash of the file's contents to identify a file. This way, importing duplicate files won't lead to duplicate data. This program attempts to find any data that can be imported and uses the appropriate tool to place the RDF equivalent of an input file in the output folder. Once the RDF equivalents are available, they can be imported into a triple store. The instructions for this depend on the triple store. I quickly realized that the lack of prototyping tools were a real time-waster for most users. When programming in R, there's RStudio, but when composing SPARQL queries, there's only a plain-text string or form field available to the users. That needed to change. The prototyping interface needed to be easily accessible, multi-user, and get out of the way of a user's productivity. Therefore, I chose to implement it as a web service, meaning users need not to install or configure anything. Having had positive experiences with Guile Scheme's web modules, I decided to write the web service in Guile Scheme. This page is missing some flashy plots and interactive graphs. We need to save something for version 1.0.0, don't we? In this case, that there are 3124 samples available in the triple store. In future releases it would be interesting make plots that link back to their originating query, making the layer of software behind a plot more accessible with a single touch or click. There is still a lot to be gained in this area. Before 1.0 we may want to add a “share with other user” button to enhance the experience for pair programming sessions. Determine the relevant predicates for our real question. 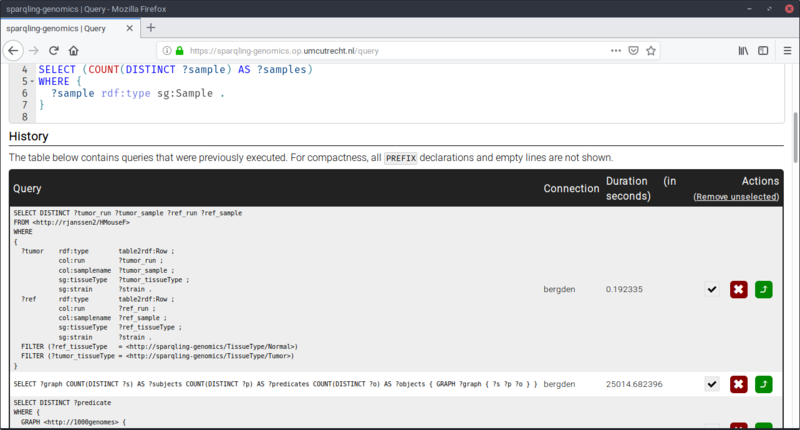 This connection -> graph -> types -> predicates structure makes finding predicates to use in reach within a few clicks rather than writing the queries. Note that the queries that lead to the list in each category is displayed below the category. The web service provides various utilities to write the query that may lead to an answer to the original research question. Integrating it with other tools is a matter of copying the final query into the language of choice. I found that the integration into, for example, R, is quite seamless, because the result of a query is a table, which fits well in R's data frames. 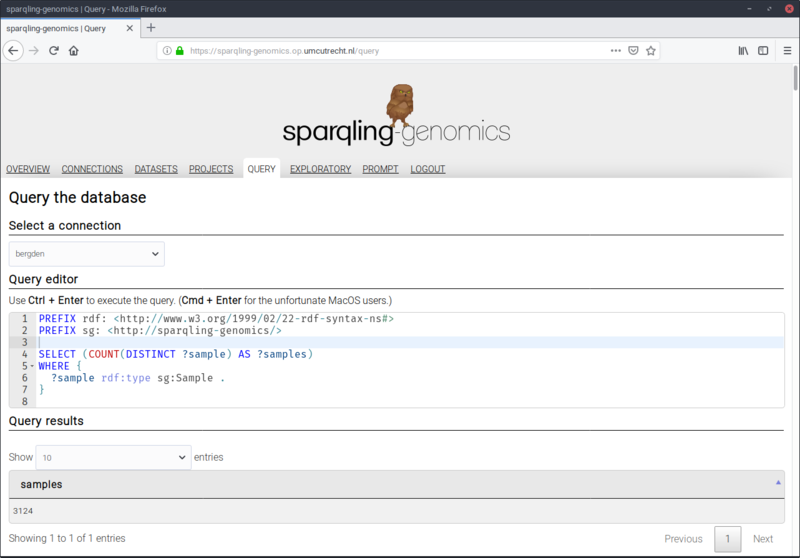 A user can use the SPARQL package in R, and execute the final query from the prototype, and move forward from there. 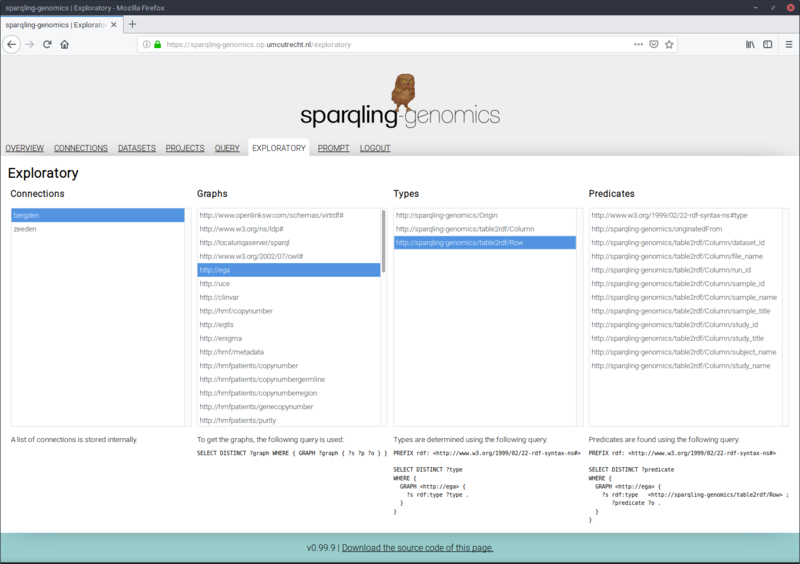 I've tried to show you the highlights of SPARQLing-genomics. I spent a considerable amount of time writing documentation, which can be obtained from the Github page. It goes more in-depth on the command-line tools, and on how to deploy the web service on your own infrastructure. Recently I attempted to load all GNU Guix packages into a triplet store. For this we need to find or create an ontology that describes software in a compatible way with GNU Guix.